You can reach Cologne Bonn Airport (CGN) easily by bus or rail from Cologne City Center. The railway station is right in the centre of the airport and offers public transport services to Cologne City Center every 20-30 minutes (duration about 15-25 minutes). S-Bahn (Suburban Railway) no. 13/19 to station "Dom/Hauptbahnhof", then change to tram no. 5 (direction Heumarkt) to station "Heumarkt". S-Bahn no. 13/19 to station “Köln/Messe Deutz”, then change to tram no. 1 (direction Weiden West) or tram no. 9 (direction Sülz) to station "Heumarkt"
Train no. RB 6a or RB8 to Cologne Central Station and then change to tram no. 5 (direction Heumarkt) to station "Heumarkt"
From Düsseldorf Airport (DUS) there are public transport services to Cologne City Center and the conference venue every 20-30 minutes. Transfer duration is in the range of 45-60 minutes. Train connections from Frankfurt Airport (FRA) to Cologne City Center are provided at 20-45 minutes intervals. Shortest transfer duration is about 1 hour. Cologne is very well connected to the German railway network, both by fast intercity links and regional trains. The conference venue is located close to Cologne Central Station and to the train station "Köln Messe/Deutz", which are connection points for regional and inter/national trains. To search for a train connection, please go to the homepage of the Deutsche Bahn. On arrival at Cologne Central Station take tram no. 5 (direction Heumarkt) to tram station "Heumarkt". You can also reach the Gürzenich Köln on foot from the Central Station in approximately 10 minutes. Coming from Cologne Central Station take tram no. 5 (direction Heumarkt). For further information see also public transport within Cologne. Descriptions of journeys to the conference venue by car are provided online. There are car parking facilities in the Heumarkt-Parkgarage (Markmannsgasse 1-3, 50667 Köln) and in the Parkgarage “An Farina” (Laurenzplatz 4, 50667 Köln). Both parking facilities are located within walking distance to the conference venue and offer about 300 parking spaces, each. Cologne offers manifold tram and bus services during day and restricted services during the night. 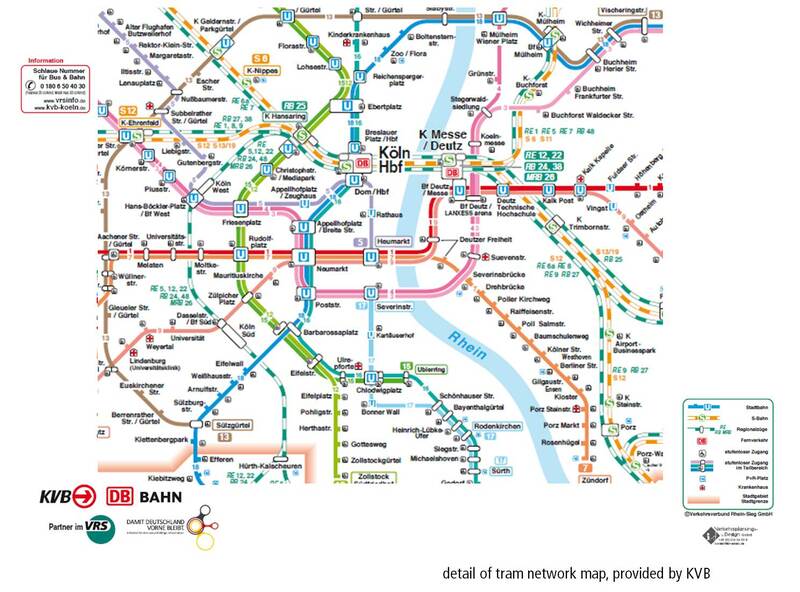 The map below gives an overview of the tram system provided in the central part of Cologne.